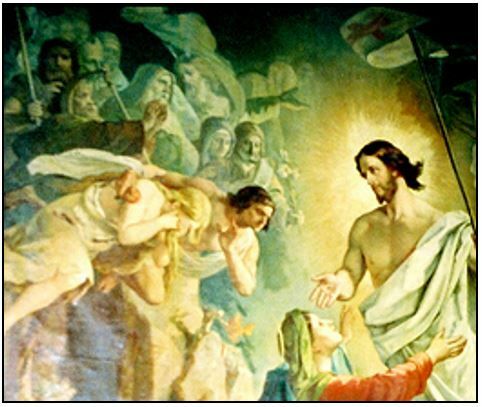 All Souls Day (November 2) is a special day that the Church has given us to remind us about how important it is to offer prayers for those who have died in the arms of Jesus but have not yet reached the full glory of heaven. Transitioning from earthly life to full union with God in heaven is usually not instantaneous. We call this transition “purgatory”. Since there is much confusion and misunderstanding about the Doctrine of Purgatory, I’m providing here a brief explanation. 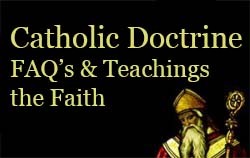 The Afterlife: What does the Catholic Church teach? We are all sinners. Even after we’ve been freed from Original Sin through baptism, we cannot become perfectly holy by our own efforts. Jesus died in our place, taking our sins to the cross. Then he rose from the dead and wants us to join him in the resurrected life for all of eternity. Those who accept this and seek forgiveness from sins will live eternally united to Jesus in heaven. Those who understand this yet reject it will die full of sin, unable to enter heaven, opting for hell so as to avoid spending eternity with God. Those who follow Christ but fail to seek forgiveness for all of their sins will still go to heaven, but in order to enter into the fullness of unity with God they must be purified — purged (thus the name “Purgatory”) — of everything that’s unholy. Jesus spoke of Purgatory every time he taught that sinners who belong to the kingdom of God will have to be “put into prison” until they’ve “paid the last penny” of their debt. Since the earliest years of Christianity, it’s been known that we cannot take our sins into heaven. Unrepented sins must be purged from us. 1 Cor. 15:51-57 points out that “that which is corruptible (our flesh-nature) must clothe itself with incorruptibility.” Purgatory is a process of purging ourselves from what was worldly so that we can fully enter into what is eternal. Purgatory comes from the Latin word for cleansing fire. Some people confuse this with the fires of hell. Think instead of the “fire of the Holy Spirit.” When we die believing in Jesus, we come into full contact with the Holy Spirit (the “Beatific Vision”). We are delivered from the limitations of our human brains, and suddenly we realize how unlike Christ we had been on Earth. Now completely aware of what was unholy in us — our persistent sinful habits and an insufficient desire to do penance — it deeply pains us to see the damage caused by our sins. This pain would last forever if God did not provide, in his great mercy, a cure. Purgatory is a gift of God’s mercy, not a punishment. He gives it to us because we want it. The fiery, purifying pain of purgatory is fueled by our yearning to live eternally in total, holy love. Because we long to be purified, purgatory is a gift from God to fulfill that longing. It is good that our regrets pain us to the core; it’s a fire that burns up our impurities. Fueled by our yearning to be united with the fullness of God’s holy love, this pain is intensified by the realization that we could have expiated our sins while on Earth, through the Sacraments, prayer, and good works. Saint Catherine of Genoa wrote that the desire for God is an ardent fire more consuming and painful than any earthly fire. Saints Thomas and Bonaventure held that the slightest fire of Purgatory is more painful than the greatest sufferings of this world. The reason is because, during our journey on Earth, we don’t really understand how great is God’s love and how much we’re missing by not loving others as he does. Does God’s mercy help those in Purgatory? God longs to reach all of us with his love, and so he expresses his love to those who are in Purgatory by consoling them. His compassion is infinite, and he offers it freely. This relieves their suffering, but only to the extent that they are open to it. The less they accepted his love before they died, the less they are ready to do so now. Likewise, the more purified they become, the more they open themselves to his mercy. Is there any joy in Purgatory? Yes! We must never focus only on the suffering of Purgatory and forget the joy. Pope Saint John Paul II liked to point out that purgatory is a place of joy. Let’s not forget that! Your departed loved ones who believed in Jesus are rejoicing in the Beatific Vision to the extent that they are ready to be united to it. They are rejoicing because they are free from evil and are totally with God, even if they are also still suffering from the agony of knowing how much damage they have done against God through their earthly sins. They prefer Purgatory over Earth because they are free from Satan’s attacks and the old temptations, and they are surrounded by other souls who are likewise free. They have no more enemies! As Wisdom 3:1 says, “The souls of the just are in the hand of God, and no torment shall touch them.” Wisdom chapter 3 goes on to say that we are chastised, but we will be greatly blessed. God purifies us the way gold is purified in the furnace. (This analogy of purification creates the notion of fire in Purgatory, though it’s not a literal flaming fire like we have here on Earth). We become “sacrificial offerings” that God takes to himself. In other words, in contrast to the tortures of hell, the pain of purgatory is really a blessing, not a torment. The terrifying descriptions of Purgatory that popular in some “revelations” today are exaggerations and are not founded in the teachings of the Church. Such punishment runs counter to God’s mercy and the incomparable dignity of those who have been redeemed by Christ. Can our loved ones who are in Purgatory pray for us? Learning about the sufferings of Purgatory should motivate us to purify our lives now. But this isn’t the only thing to know about Purgatory. Rejoice that your loved ones who have passed from earthly life are closer to God than ever before! They love you more than they did before. They can pray more powerfully than they could before. Of course they remember you and love you and pray for you! How long does purification take? To understand the answer to this, we must suspend our concept of time. The after-life exists in eternity. Eternity dwells outside of our linear time. The past and the future are both now and yet not now. The suffering experienced by the souls in Purgatory cannot be measured by days or years, but by intensity. If we could watch a loved one journey through purification, it might seem to take years, but to our loved one, it might last but a moment and yet be extremely difficult to bear. Or it might last for a long time without the soul being aware of time’s passage. The process is one of peeling away the layers of spiritual scars, many of which, while on Earth, remained below the level of our consciousness. Everything in us is exposed. This might happen in an instant, which is why we say after near-death experiences, “My life flashed before my eyes.” But now our whole person must be penetrated with the light of Christ. As the purification progresses, our full personality emerges for the first time. We become the child of God that the Father had intended when he created us, with all of our talents, gifts and abilities to glorify the Holy Trinity. Can we help souls in Purgatory? Purgatory will exist until the second coming of Christ and his final judgment. Until that time, the souls there definitely need our help. No longer on Earth, they cannot rectify the damage that resulted from their sins. Their opportunities to make amends have passed. During their lives, they set the speed at which they now grow into the full experience of the Beatific Vision, but we can quicken their purification. Helping them is one of our responsibilities as part of the communion of saints, i.e., the community of all who are joined in Christ on Earth, in Purgatory and in Heaven. Since the action of any member affects all others, we can help the souls finish their purification. Through Jesus and our love, we can perform on their behalf prayers, alms, fasting, sacrifices, deeds of penance, good works and other acts of piety. We can also offer up Masses, publicly and privately, in which we give them our love and commit them to Jesus’ love. Our love fills and animates these souls. The celebration of All Souls Day and the whole month of November is given over to this important ministry of the Church. Traditionally, the Church has placed more emphasis on helping those in Purgatory than we do today. We need to give importance to this ministry of intercession, and include praying for those we’ve never met. We need to make All Saints Day a bigger celebration than Halloween, and we need to attend Mass on All Souls Day for the sake of our loved ones who have died. Can we shorten our own time in Purgatory? Our daily goal should be to purify our lives and grow more deeply into the fullness of God ‘s love while we still have the Sacraments available to boost us. God should be no stranger to us. Neither should his Word, which is our guide to living a holy life. We dare not remain lazy about getting rid of unholy desires, worldly attitudes, unloving deeds, and ignorance about what God wants from us. The more we unite ourselves to his love now (through prayer, reconciliation, penance and purification), the less suffering we will endure in Purgatory. Purgatory is an “emergency” entry to Heaven for those who believe in the salvation offered by Christ but have wasted their time on Earth with activities and attitudes that are contrary to the Kingdom of God. There is a different door to choose, and we have the freedom to choose it! Furthermore, she said: “[T]he Fire of Love is more sanctifying than is the fire of Purgatory….” If we live now in the state of continually striving to love more perfectly, i.e., to love God with our whole heart, mind, and soul, and to love others as ourselves (Luke 10:27), which Jesus tells us is the greatest commandment and it sums up all others, we are purified here on earth. Every day there are opportunities of suffering — when loving is difficult, forgiving others is necessary, and we can give ourselves unselfishly to the needs of others — and this purges us of unholiness right here and now. Going directly to Heaven, without the need for Purgatory, is a matter of trust. We cannot earn Heaven by our own merit through our good deeds, but good deeds are a result of real love (which is “perfect” love). In this love, we know the love of God and we know we can trust God. This keeps us close to him. We know, in trust, that Jesus walks with us daily, and so of course we can also trust that He will take us with Him straight to the Father at the moment we leave the world! Every day, do everything possible to stay close to Jesus, and you will die in His arms, and He will carry you directly to Heaven. In this is love perfected with us, that we may have confidence for the day of judgment, because as He is, so are we in this world. There is no fear in love, but perfect love casts out fear. For fear has to do with punishment, and he who fears is not perfected in love” (1 John 4:17-18). The lives of all are to be revealed before the tribunal of Christ so that each one may receive his recompense, good or bad, according to his life in the body (2 Corinthians 5:10). The work of each will be made clear. The Day will disclose it. That day will make its appearance with fire, and fire will test the quality of each man’s work. If the building a man has raised on this foundation still stands, he will receive his recompense; if a man’s building burns, he will suffer loss. He himself will be saved, but only as one fleeing through fire (1 Corinthians 3:13-15). “You worthless wretch! I canceled your entire debt when you pleaded with me. Should you not have dealt mercifully with your fellow servant?” Then in anger the master handed him over to the torturers until he paid back all that he owed(Matthew 18:32-34). Lose no time; settle with your opponent while on your way to court with him. Otherwise your opponent may hand you over to the judge, who will hand you over to the guard, who will throw you into prison. I warn you, you will not be released until you have paid the last penny (Matthew 5:25,26). The reason why Christ died for sins… was that he might lead you to God . . . It was in the spirit that he went to preach to the spirits in prison (1 Peter 3:18,19).